It has been a long time since we last mentioned GPLv3 in the context of ACT (or vice versa). ACT has littered the World Wide Web with GPLv3 smears and libel, most likely on behalf of a very major client. This apparently-national/global entity called “Association for Competitive Technology” (how ambitious a name!) is little more than the public face of Jonathan Zuck, who has a small lobbying firm/pressure group whose big customer is Microsoft. It pretends to be operating in the interest of small businesses, but it’s little more than a law-manipulating shill-for-hire pool — one that’s intended to serve large (and paying) customers. “Microsoft was bound to be negatively affected and it couldn’t sit aside idly. It needed to throw a wrench in.”When GPLv3 made its debut — and even beforehand — there was a media storm that was intended to daemonise this good licence. The bad reputation was partly generated not by those who are open source developers but by those to whom Free software is a threat; a finance threat to be more precise. Microsoft was bound to be negatively affected and it couldn’t sit aside idly. It needed to throw a wrench in. To again credibility in its criticism, a seemingly broad mouthpiece (proxy) would be needed though. ACT was only one of them, but probably the most prominent one at the time. Palamida continues to track adoption of the GPLv3 and it indicates that the oceans of FUD Microsoft has bought itself, including low-key payments to academics (never forget academic kickbacks), were at best able to slow down — but never to defeat — adoption of this evolutionary licence. 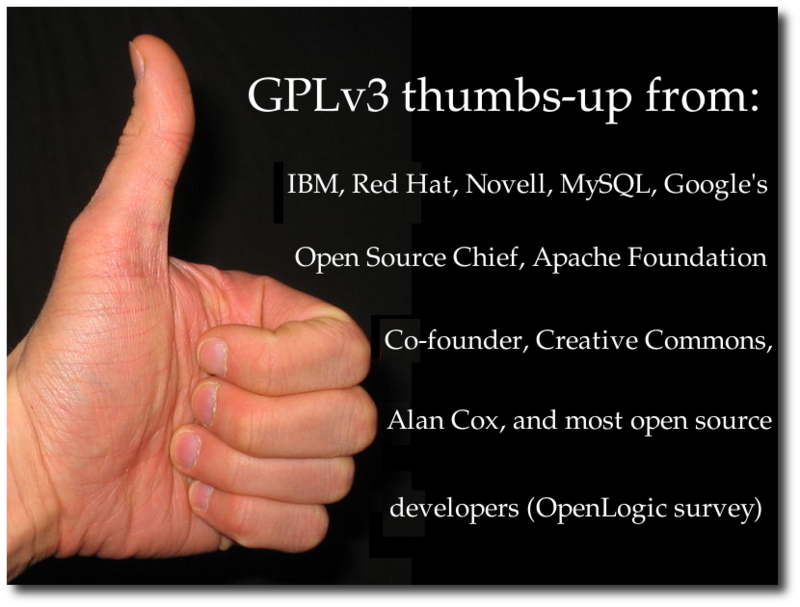 The year has gone by quite quickly since the GPL v3 was first released. We have just entered into the month of the release, and it is only 23 days until a complete year has passed. It doesn’t seem like we have been tracking the GPL v3 and its derivatives for a year, but it is more believable when you look at the count. Cumulatively, the GPL v3 and its derivatives have gained over 2800 adopters, which is an impressive number. Thousands of projects have, and now we can more confidently say thousands more will adopt the GPL v3, proving its significance in the open source community. Surely enough, there will be those who are not easily convinced by empty accusations, so we bring back some articles from last year. Recall ACT and remember how much Microsoft loves them. It needs them, just like it needs CompTIA [1, 2]. It would only be fair to state what these pressure groups really are about. In practice, it’s little less than legalised bribery, a scam. Typical signs: pompous Washington-based people in suits and some name for a firm that’s intended to generalise and expand its scope. It make it seem like more than a one-man operation (Enderle ‘group’, anyone?) or a small part-time/casual group of affiliates. Had the congress been more ethical, groups like these would be shut down and declared illegal. But they are not declared illegal, so it’s something we must live with and at the very least inform people of. ACT has been accused of being an industry front for Microsoft, promoting a Microsoft-friendly agenda in relation to property rights and anti-trust legislation. ACT wasn’t the only Microsoft lobbying front that battled GPLv3. There are the usual anti-Linux figures such as Dan Lyons and Rob Enderle. for example. To give you an idea of how it works, read the following old piece. The GPLv3 FUD may have not been successful, but Jonathan Zuck and his vile lobbying arm are currently fighting for software patents in Europe [1, 2, 3, 4] and fighting against ODF (you can easily find Zuck slandering ODF in Congress and in the press). We’re so excited about the award, we can barely contain ourselves!!! Just tell us where, when, what the dress code is (I’m assuming we may have to rent some of those tshirts with the tuxedo front printed on them), and we’ll be there!